Welcome back to the Arne Wellness Center blog, and thank you for joining us for the conclusion of this short blog series. In parts one and two, we’ve been exploring the many benefits of routine chiropractic care for patients of all ages. Chiropractic is one of the safest and most effective therapies for treating a range of neuromuscular complaints that cause pain and limited mobility, which can affect your ability to live a healthy, happy life. Be sure to visit our recent blogs to learn how chiropractic care can help you optimize your health. 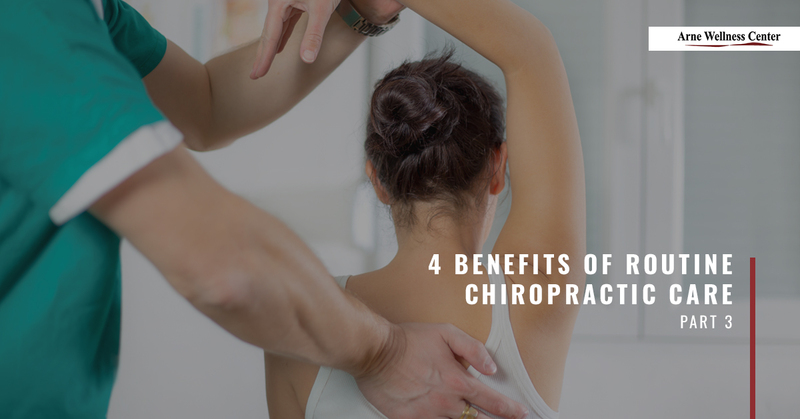 In today’s final installment, we’ll look at four more ways your chiropractor can help you find lasting relief from a number of conditions while improving your whole-body health and wellness. If you have any questions or want to schedule a consultation, please reach out to your Top Rated Local® chiropractor in Littleton to arrange an appointment. For those who suffer from high blood pressure and/or hypertension, a chiropractic adjustment of the Atlas vertebrae can help normalize blood pressure. The Atlas vertebrae (C1) is the first vertebrae in your cervical spine, which holds up the head. A study conducted by the University of Chicago in 2007 reports that spinal manipulations of the Atlas may lower blood pressure and aid in the treatment of hypertension. This study suggests that removing misalignments in the cervical spine via the Atlas can restore healthy blood flow and lower blood pressure. The American Migraine Foundation reports that as many as 37 million Americans suffer migraine headaches, which can cause debilitating pain. Additionally, stress, trauma, and tension in the tissues of the neck, upper back, and shoulders can cause headaches and contribute to migraines. Chiropractic adjustments of the neck and upper spine can reduce stress and tension in these areas, reducing aggravation on the spinal nerves to improve nerve function and reduce overall stress on the body. As a result, patients report reduced pain, a decrease in headache frequency, and shorter headaches after onset. As we mentioned in part two, the nervous system and the immune system are closely linked. Because chiropractic adjustments not only strengthen the immune system, but also improve communication between the brain and the spinal cord, proper alignment of the spine can stimulate proper regulation and coordination of the body’s natural reaction to allergens. The body has the incredible ability to heal itself through the central nervous system. When there are blockages in the central nervous system in the form of stress, tension, pinched nerves, and disc herniations, communication is hindered, making it difficult for the central nervous system to send signals to other areas of the body. Chiropractic adjustments correct these misalignments, thereby opening up the lines of communication, stimulating the body’s natural ability to heal and recover from pain, injury, and other neuromuscular complaints. Chiropractic helps people of all ages and abilities better manage their pain, improve their wellness, and stimulate the healthy function of the whole body. If you’re ready to find out how chiropractic can help you, reach out to Arne Wellness Center to schedule a consultation. Dr. Arne is recognized as a Top Rated Local® chiropractor in Littleton, with extensive training and experience in natural healing ranging from chiropractic, acupuncture, and internal medicine for pain relief, auto injury treatment, Lyme disease treatment, and so much more. Experience natural healing and wellness care today.